For a job that doesn't actually require flying (and not crashing) a multi-million-dollar aircraft, Army military occupational specialty (MOS) 15Q, air traffic controller, still seems like a pretty heavy load to carry. Luckily, the reward for a job well done is not only the satisfaction of making Army airspace safer, but also knowing you've mastered a job that's pretty difficult to break into without the kind of experience the Army offers. In some ways, being an air traffic controller might arguably be harder than flying the plane -- after all, with responsibility for the movements and flight patterns of all craft in your assigned airspace, it's a bit like flying all of those planes at once. GoArmy.com describes the job in deceptively simple terms, saying that controllers "[c]ontrol airborne and ground traffic" and "[p]rocess flight plan data and maintain logs, records, files and tape recordings of voice communications." The more technical job descriptions in official Army literature are . . . well, so technical that I can't even figure out a satisfactory digest version for you, dear reader. It suffices to say that during a shift, an Army air traffic controller maintains radio contact with all approaching, departing, and in-flight aircraft; manages flight plans to ensure there are no collisions, crashes, or violations of airspace rules; and provides guidance to pilots using both visual and instrument flight rules, as the situation dictates. They operate at established Army airfields as well as temporary expeditionary fields constructed for combat or contingency operations. And with experience and promotion, Army air traffic controllers may also find themselves as special advisors or liaisons with the Federal Aviation Administration (FAA) on behalf of the Army. If you're interested in becoming an Army air traffic controller, you'll obviously need your high school diploma and a ride from your recruiter to the nearest Armed Services Vocational Aptitude Battery (ASVAB) testing facility. 101 or higher is necessary in the skilled technical (ST) aspect of the test to be considered apt for the job. In addition, potential 15Qs must submit to a detailed background investigation to prove themselves eligible for a secret security clearance, and they must have normal color vision. Diagnosed alcohol abusers are normally given the boot, though waivers are possible for those who successfully complete an Army or civilian treatment program and stay sober. Sale or use of illegal drugs will also cause you a lot of heartache getting in the door, with a kind exception made for "teenage civilian experimentation with marijuana," according to the Army's MOS Book. After graduating Army basic training, 15Qs are assigned to a 15-week formal training course at Fort Rucker, Alabama, home of the Army Aviation Center. The MOS Book states that soldiers graduate the Fort Rucker course "with an apprentice level of knowledge" and focuses on "the combat-critical tasks of the MOS" using classroom and computerized training materials. The Army Civilian Acquired Skills Program (ACASP) is designed to allow trained and skilled civilian professionals to enlist in certain career tracks without attending entry-level training. (Not so fast -- you do still have to go to boot camp, recruit.) To skip school at Fort Rucker and become a 15Q, applicants must have two or more years of experience as air traffic controllers and hold a current FAA control tower operator's certificate. 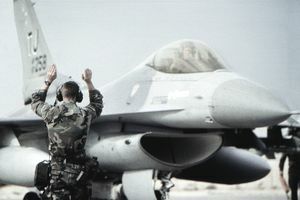 Army Credentialing Opportunities On-Line states that the GI Bill will contribute money toward earning a civilian Aircraft Dispatcher license through the FAA. The site also lists a number of related certifications eligible for GI Bill money, including Accredited Airport Executive, Project Management Institute (PMI) Risk Management Professional, and CompTIA Certified Technical Trainer. Army air traffic controllers are also eligible to enroll in the Partnership for Youth Success (PAYS) Program for a guaranteed opportunity to interview with civilian companies after leaving the Army. GoArmy.com specifically mentions that 15Qs may want to tap PAYS for a shot with companies like AAR Aircraft Services, Lockheed Martin, Raytheon, or L-3 Communications Linguist Operations & Technical Support.